Thrifty Thursday Vol. 62: That’s One Big Santa! Hi everyone and welcome to this week’s edition of Thrifty Thursday, where I share my weekly thrift store/swap meet/estate sale finds. The finds for this week are actually all from the week before last or earlier, as I spent most of my free time over the last week or so absorbed in craft fair duties. We didn’t go to any estate sales at all last weekend, which is the first time we’ve skipped them in quite awhile. Hopefully we can make up for it this Saturday! This Santa was one of our best finds! I’m not sure if you can tell in the picture, but he is seriously HUGE! He’s covering the knob of the door behind him, for reference. The funny thing about him is that we actually had seen his twin in a different thrift store a couple of weeks before, but it was priced at $40. That’s just too much! We agreed that he was seriously awesome, but we would only pay about $20 for him, max. Lo and behold, this guy popped up in another thrift store- for $20! We snatched him up right then. I think he might have to live with us permanently. The only thing is, he’s pretty dirty (especially the beard) and I need to try to clean him. Any tips for cleaning huge vintage plush toys? I’m also going to make him a new belt buckle out of felt. 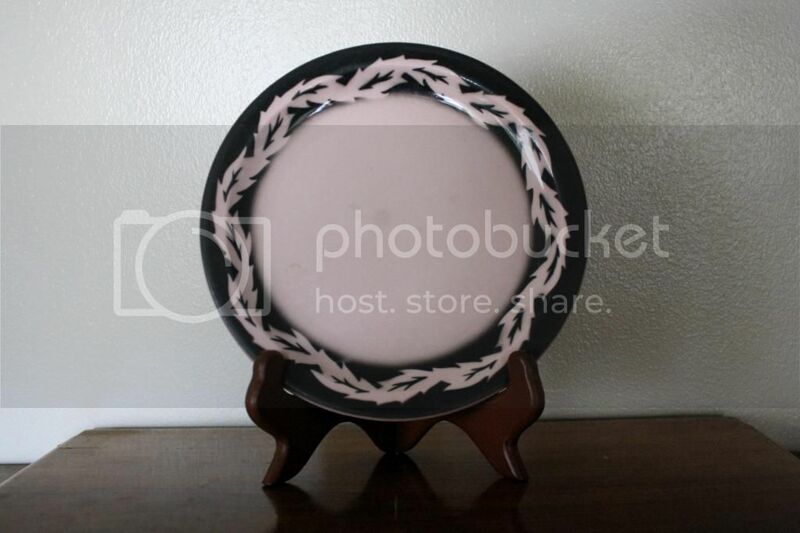 This next one is actually an antique store find (sorry if that’s cheating!). Phillip bought it for me in a local shop. How cute are the graphics? 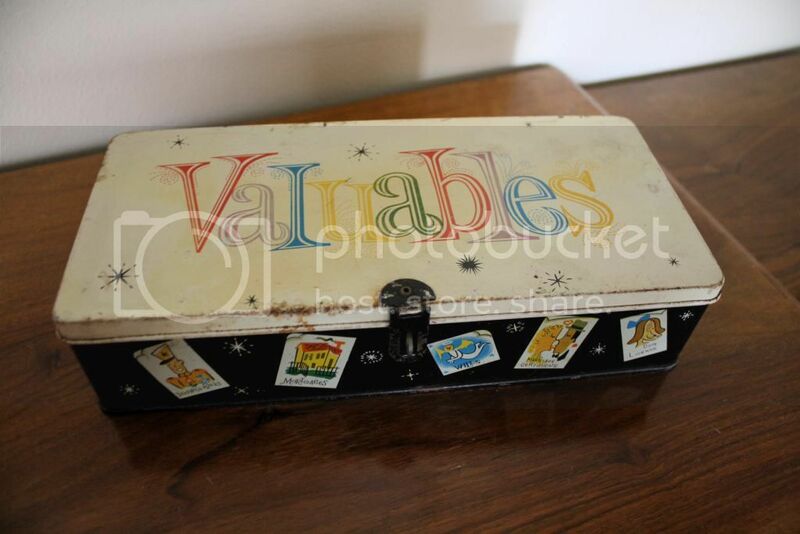 On the side are suggestions of what to put in the box: discharge papers, mortgages, wills, marriage certificates, and dog licenses. I’m not really sure what I’ll put in it. Maybe my passport? 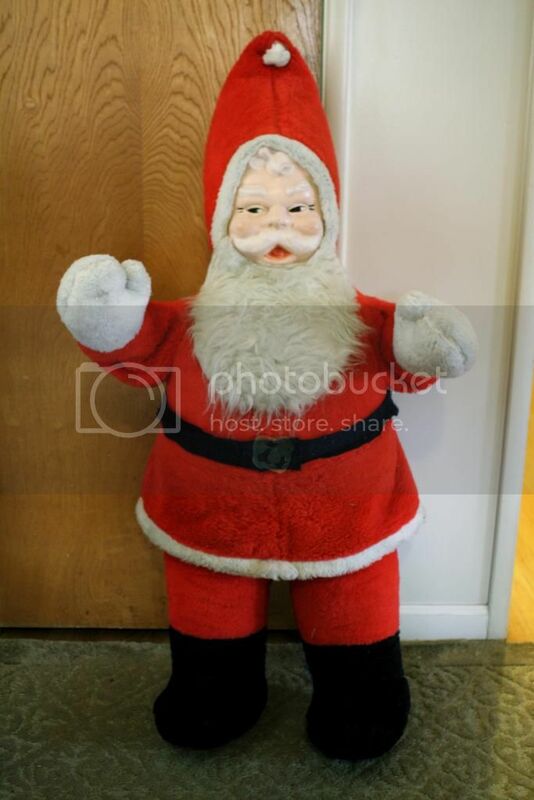 This guy was from the same thrift store as the other Santa and I’m also keeping him! 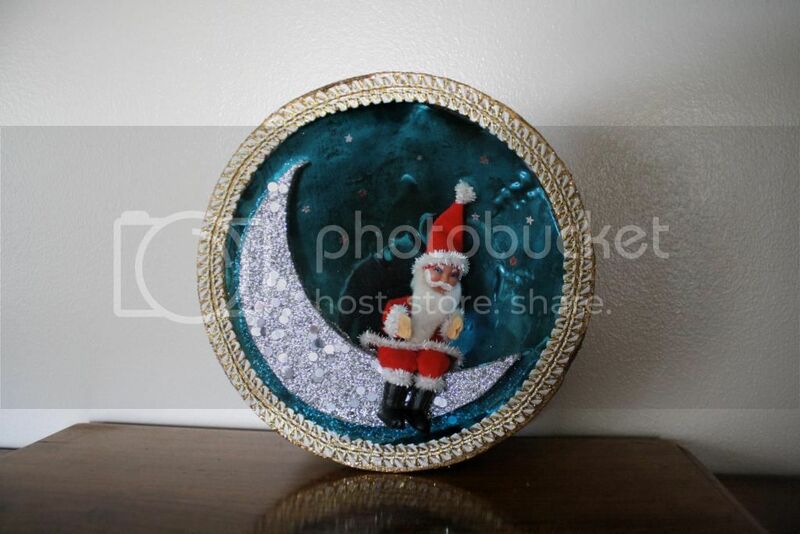 I’ve never seen a Santa on the moon before, have you? He’s already hanging on our light fixture. 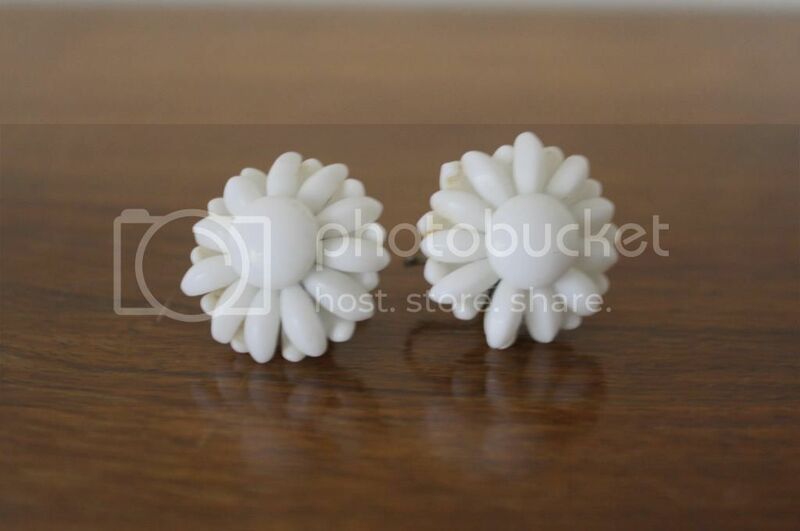 I found these white daisy earrings a couple of weeks ago for 50 cents at a thrift store. They’re screw-back, which always seem to fall off of my ears, so I’m going to try to convert them to posts on of these days. 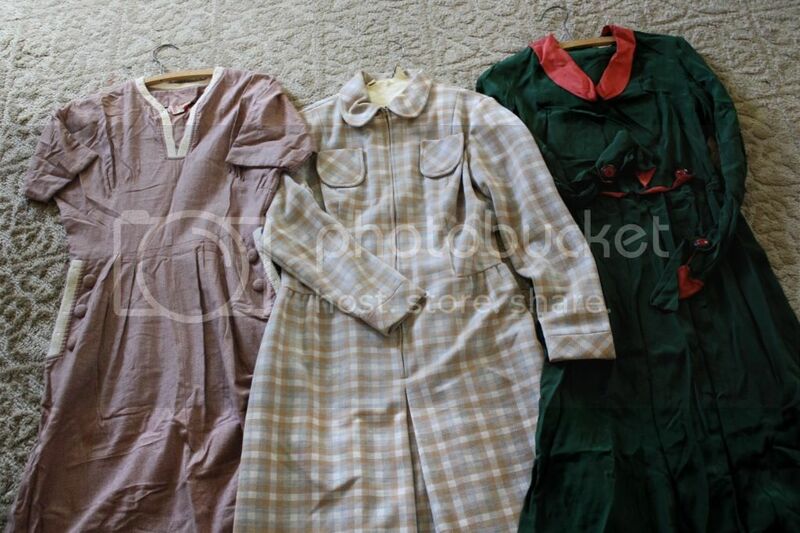 These dresses were bought at an estate sale a couple of weeks ago, but I forgot to snap a picture of them then. The left and middle one are in good shape, but unfortunately the beautiful green and coral one has a rip on the back of one sleeve that I didn’t see until I got home! (I should have inspected it more carefully before I bought it, but I got caught up in the crazy estates sale atmosphere). I’m debating between trying to sell it anyway and maybe get back the $10 I paid for it, or hanging it on the wall in my sewing room as a piece of art. What do you think? This last find is Phillip’s, as you can probably tell. 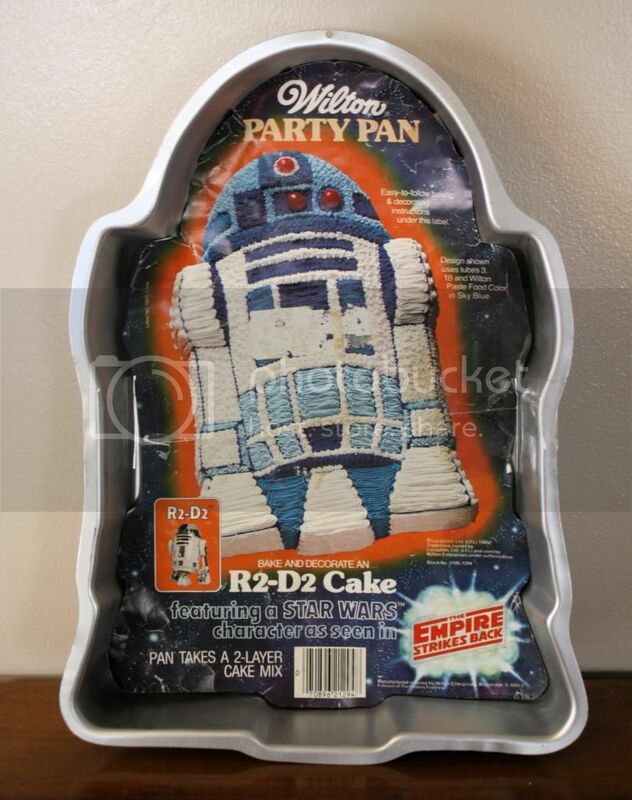 It’s an R2-D2 cake pan- never used for some reason. I think he’s going to list it on Ebay. Well, that concludes my finds for this week, thanks for checking out this week’s Thrifty Thursday! 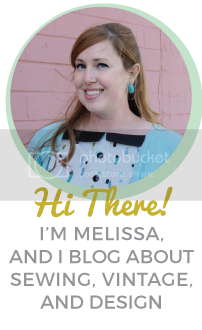 As usual, I’ll be linking up at Apron Thrift Girl, A Living Space, Sir Thrift A Lot, and Joyful Treasure Hunting, so head on over and check out what everyone scored this week!